When researching ‘things to do in Mumbai’ a visit to the is always towards the top of every list. An overnight stay at this iconic hotel is very much recommended, but if you are short for time then get the next best thing with a stop at the Sea Lounge restaurant for Afternoon Tea. The location is picture-perfect. 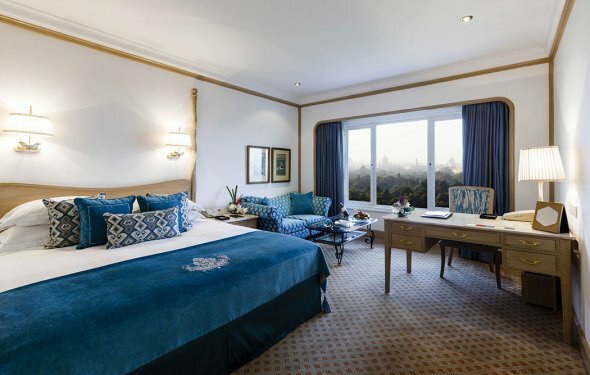 After spending a few hours sightseeing around the Colaba district taking in the local markets, shops, and the Gateway of India, you will be more than ready to relax in the tranquil setting of the Sea Lounge. Tip: If you can, arrive towards the start of afternoon tea at 4pm to nab a table by the window, as you will have an excellent view of the Gateway, and be able to watch the hustle and bustle on the street below. Don’t be put off by the high security at the various entrances to the hotel, a relic from the terrorist attacks in 2008, and found throughout Mumbai now. Tip: If you do get to stay overnight at the hotel then take advantage of the hotels private tour that is only offered to residents. A guide will walk you around the hotel explaining its rich history, details about the differing architectural styles, and pointing out elements that the average visitor will not notice. The entrance to the restaurant is quite impressive. From the main hotel entry, walk towards the old wing of the hotel, along the corridor lined with pictures of the famous people who have visited this hotel, and then climb the grand staircase to the large glass doorway on the first floor. As the door opens you are greeted by the sound of the pianist, the sight of elegant table settings, and the aromas of the delicious food that you are about to sample. The restaurant offers an al la carte menu or a fixed price afternoon tea, the later being what I have enjoyed on the few occasions I have dined at the Sea Lounge. The waiters are well used to entertaining visitors to Mumbai and will gladly talk you through the various food options. Personally I like to enjoy a glass or two of bubbly when I visit but the extensive tea menu is also worth sampling. To begin with our waiter brought us a three-tired plate rack filled with various finger sandwiches, savory pastries, and a top layer that included very British looking scones and jam. Our initial food selection had been made after the waiter established if there were any vegetarians in our group. We were also strongly advised to visit the buffet area and fill our plates with all the goodies on offer. As if this wasn’t enough food, our waiter then brought us a selection of ‘street-food’ that he assured us was delicious but also healthy (I think he meant it wouldn’t give us Delhi belly, not that the fried food was heart healthy). Tip: Make sure you go with a hearty appetite; you will need it to really do this experience justice, as there are just so many delicious options to sample. The service at the Taj is really first class. During out visit for afternoon tea at the Taj Mahal Palace Hotel, Mumbai we were given time to relax and enjoy our tea, but also strongly encouraged to enjoy repeated trips to the buffet. We were given assistance with selecting what to eat, and made to feel like honored guests at a grand establishment. The Sea Lounge is the perfect place to unwind after a days sightseeing, or for those of us that call Mumbai home, an ideal spot to visit and be treated like a princess.